Almost as new, but upper corner of front cover and most of the pages have curled a bit. Text pristine. 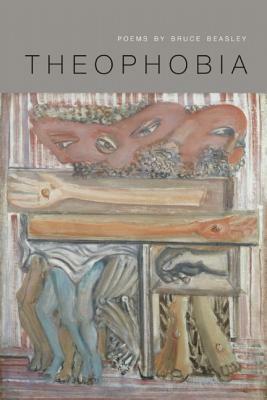 "Theophobia" is the latest volume in Bruce Beasley's ongoing spiritual meditation which forms a kind of postmodern devotional poetry in a reinvention of the tradition of John Donne, George Herbert, Emily Dickinson, Gerard Manley Hopkins, and T. S. Eliot. "Theophobia" is structured around a series of poems called "Pilgrim's Deviations" and forms a deviant and deviating pilgrimage through science, history, politics, and popular culture. Beasley seeks the Biblical Kingdom of God among Dolly the cloned sheep, the wonders and horrors of extremophilic creatures living in astonishing intensities of temperature, robotic phone operators, and Wikipedia's explanation of the mysteries of the Holy Spirit. Bruce Beasley is the author of six poetry collections, most recently "The Corpse Flower: New and Selected Poems" (University of Washington Press, 2007). He has won fellowships from the NEA and the Artist Trust of Washington and three Pushcart Prizes.